The oil industry is organized into three sectors: upstream, mid-stream, and downstream. Upstream comprises those who focus on exploration and production. If these people are successful in discovering and producing hydrocarbons, the work and energy flows to the professionals in the mid-stream sector who build and optimize the pipelines and other infrastructure that facilitates trade and storage of the oil and gas. Through these intricate networks hydrocarbons are transferred to the downstream sector where further processing, refining and upgrading occurs. The lines of mid-stream and downstream often blur; both work to distill the hydrocarbons to various pure products like methane, ethane, butane, propane and octane. Downstream refineries and petrochemical plants turn these raw chemical compounds into consumable products like gasoline, diesel, kerosene, jet fuel, lubricants, fertilizers, asphalts, pharmaceuticals, plastics and millions of other products that a modern civilization utilizes every second of every day. The finished products are sold through retail outlets, where they are used in everything from fertilizing food to flying across the world to manufacturing and powering laptops. The above chart from the Bureau of Labor Statistics (BLS) represents the increase in job growth that has run concurrent with the North American shale oil and gas revolution. This is only one sector of the oil and gas industry. When adding the other streams to this total, the BLS numbers are close to 2 million jobs all held by people dedicated to providing over 60% of the total energy used by the people of the United States. By producing the fundamental fuels and building blocks used in so many industries, it is estimated by IHS Global Insight that for every onshore job created by an independent oil company there are more than four jobs created, bringing the job total to 9.2 indirectly or directly caused by the oil and gas industry. In states with vibrant oil and gas industries such as Alaska, North Dakota, Texas, and Louisiana, job numbers have returned to pre-recession peak levels. Meanwhile, in other states such as California, which has large hydrocarbon potential but stifling anti-development philosophy they are still at double digit unemployment. The industry’s vibrant work force is well rewarded for its efforts. According to BLS data, the total payroll for upstream oil and gas in 2011 was over $53 billion, double the inflation-adjusted level of $26.7 billion in 2001. If one adds in the downstream and other petroleum-related segments, the total oil and gas-related payroll in 2011, according to BLS, adds up to $119 billion. The oil and gas industry’s central importance to the well being of every American cannot be overstated. A certain kind of person slanders the men, women, and families of the oil industry by calling them ‘Big Oil’ but as would-be accusers, they act shamefully. The industry is big, and the individuals in it extraordinary. Every day they get out of bed, leave their homes and produce and develop the lifeblood of civilization. It is an epic achievement, a daily struggle to provide the foundational material value that allows people to live and flourish. Yes, some slander this achievement. The oil and natural gas industry currently supplies more than 60% of the nation’s total energy demands and more than 99% of the fuel used by Americans in their cars and trucks while 900 of the next 1000 U.S. power plants are projected to use natural gas. 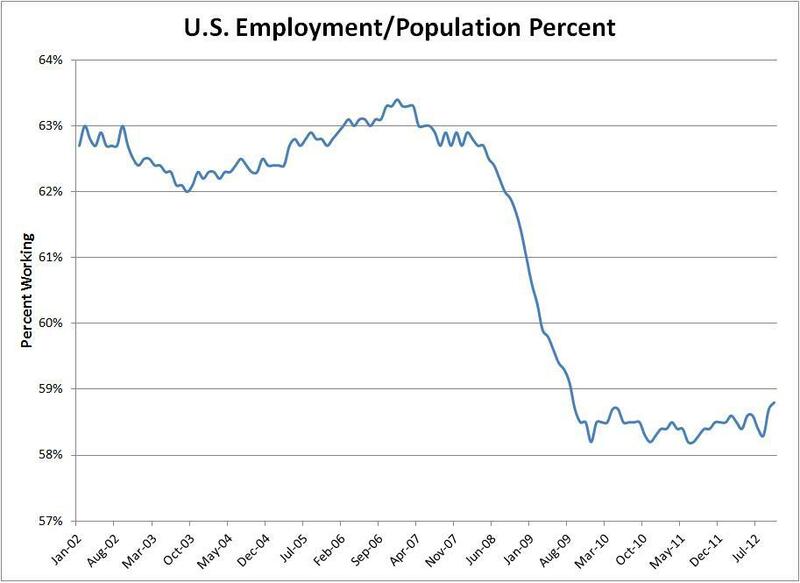 This stream of energy and jobs stands in stark contrast to the chart below. The above data is taken from the United States Bureau of Labor Statistics. The percentage is the ratio of the number of working aged people (16-64 yrs old, not including military personnel) who have been gainfully employed at least one hour in the week measured. This ratio has not been this low since the early 1980s. This chart has enormous implications as during this same period the federal deficit has grown from a little over 1% of GDP in 2007, to over 8% of GDP in 2011. Gross public debt has increased from 8.95 to over 15 trillion dollars. The government is looking to increase tax receipts, but with less people working, and an increasing number of retirees soon to draw on enormous entitlement programs, a smaller productive work force is expected to bear this burden. In stark contrast to the dismal chart above Energy Tomorrow asks us to recognize the unmentioned injection of capital investment and job creation generated by the oil industry. Consider it the energy stimulus: $476 billion delivered to the U.S. economy in 2010— equal to roughly 60 percent of the 2009 federal stimulus. It’s a stimulus that didn’t need an act of Congress and which, with the right policies, can be repeated over and over—helping to drive broader economic recovery. The oil and gas industry has been an unsung wellspring of job growth and lower fuel and material costs in a time of terrible economic strain. This is a very important thing to focus on when we look out at the stream from which free people generate values to sustain their lives. What springs from the Fountain of Youth? I have had the privilege to travel far upstream where I have met and worked with some promising young minds that are just now joining the oil industry. There is a young man whose mind makes connections so incredibly fast that he is able to bring what is hidden into view. He is a voracious self-educator, integrating studies in physics, geology, fluid flow, and computer programming at a rate few are willing to emulate. By programming his knowledge into computer simulations he can show the world what is hidden miles beneath the earth. Where one person sees a swamp, a desert, a field, he can lift the veil with his capacity to master mathematics, the language of physics. The planets deeply buried secrets can be discovered only so much as a person chooses to think, and he is always thinking. He provides evidence to treasure hunters and maps to explorers who seek energy miles below our feet. The early petroleum geologist William Platt said that “oil must be sought first of all in our minds.” This mind is up for the task. There is another young man of integrity I know whose high energy and devotion to understanding the industry makes one marvel at what his achievements will be in the coming years. He understands it is a business, that it benefits the world, and that he has the potential to do something within it better than most. His eye is critical, always assessing what actions he can take to add value. As a trader he is honest and just. While some people cry out that they did not get a big enough piece of “the pie,” this young man does not cry, nor does he make one pie; he opens up a shop and produces such an abundance of pies, pastries and cakes that even the most cynical will have too much to eat. Whether optimizing a one-hundred year old field, or discovering a new one, production volumes will increase while cost decrease wherever he focuses his attention. Thomas Edison famously stated, “We will make electric light so cheap that only the wealthy can afford to burn candles.” This is the type of mind this young man possesses. These are just two examples of the brilliance that is just now bubbling up to the surface and will serve the tradition of producing oil and gas for the U.S. and the world. The independent judgment of these minds offers so much promise that—barring they are diverted or strangled—they will become roaring rivers and geysers of productivity. The original source, the headwaters, the fountainhead of energy production is freedom. When one looks at the creativity of these young people it is hard to imagine a time of energy poverty. If the level to which they will rise is only limited by their willingness to think and develop their thoughts, then the future looks abundant, and phrases like “energy crisis” will be better remembered as the opportunity to develop more energy. To the extent they are free to create and produce, we can expect a torrent of energy exceeded only by the torrent of their ideas and ambitions. However, the extent to which they are free to unleash their productive potential is limited in the current political and social environment. The focus should not be to kneecap the people of the oil and gas industry. In an economy of 50% employment population ratio what gain can be made by attacking an industry which is adding to its employment numbers. 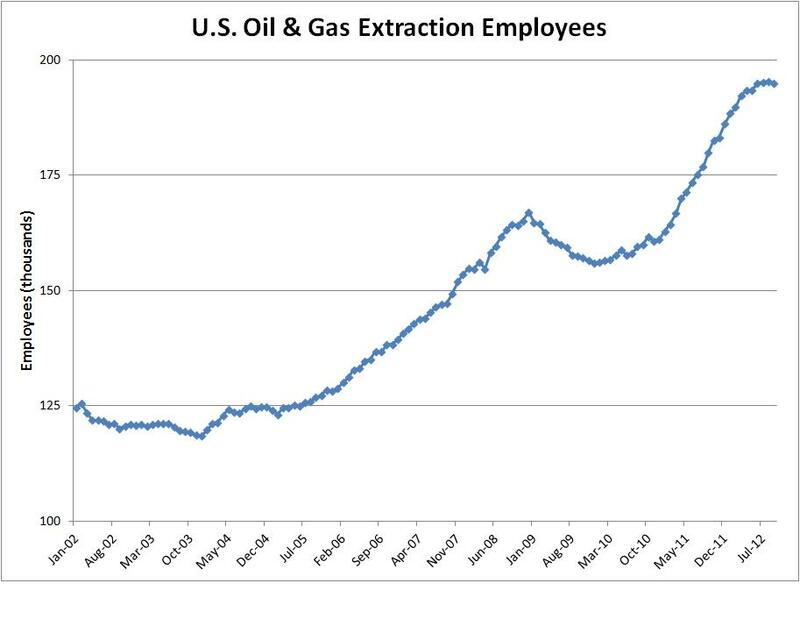 Would the American people be better off if the oil and gas industry had equally dismal employment numbers? Would they be better off if energy costs increased? People should look to the industry and determine methods to emulate this type of production and job growth. Why shackle still more one of the few rays of hope for a free and prosperous nation? Today, members of Congress have a simple choice to make. They can stand with big oil companies, or they can stand with the American people,” Obama said in the Rose Garden. It is self-destructive to frame a conflict in terms of the oil companies versus the American people; the oil industry IS the American people. Americans eat food produced with petroleum based fertilizers, harvest and transport it with petroleum powered tractors and trucks. There are millions of people employed as a result of the oil industry because its output flows through every tributary of the American economy nourishing the nation during this time of economic malaise. The extent to which real change can occur—innovations in safety, efficiency and revolutionary new technologies—depends on the extent to which the people who innovate, develop and build this change are free to do so. A nation awash in inexpensive life-giving energy must necessarily protect the rights of the producers of this energy. We are told that it is foolish to bite the hand that feeds us, but it is insane when it is our own hand that we bite.